It is spring, despite the rain and gloom in my little corner of the world. In my backyard the birds have put on their brightest colors for spring courtship. That can only mean one thing—nesting season is around the corner. It’s the perfect time for an ornithology lesson with the kids. Observing the cycle of bird life in the backyard is a great way to introduce children to the natural world. It lends itself well to unit studies for homeschooling families and teachers. It is equally suited to a more informal approach for families who just want to learn something new together. Begin your study of nesting birds with a simple question: what do birds need to survive and to raise their young? Kids can use their answers to create a poster, brief report, or even a checklist to be used in the next activity. How Can We Provide These Things in Our Backyard? Shelter—birds need places to hide from predators, people, and bad weather. The perfect American lawn offers little in this regard. You can change this by planting trees and shrubs, preferably native varieties when possible. Obviously, this is a long-term solution that will take a few seasons to fully mature. Involve kids in choosing, siting, and planting your chosen plants. They enjoy watching trees and shrubs grow over time. A short-term solution is to construct a brush pile. Use trimmings from your existing trees and shrubs. Build the pile in layers, laying branches first one way and then perpendicular, then back again. In addition to helping build the pile, children can plant climbing flowers and vines (like sweet peas or runner beans) around its base to make it a little more beautiful! Food—providing shelter will also help to provide food. Most birds eat insects, which will find homes in your trees, shrubs, and brush piles! Flowering plants will attract nectar-sipping birds as well as insects. Fruit- and nut-bearing trees and shrubs will also attract birds and other wildlife. You can maintain feeders throughout the year—always a kid-friendly activity. You won’t see the numbers you do in the winter, but they are appreciated by nesting birds busily feeding young. Be sure to clean the feeders regularly to avoid spreading disease. Water—providing water for backyard birds can be as simple as allowing a hose to drip a little into a garbage can lid or filling a clay saucer (meant to go under a flower pot) with water. Just be sure to rinse these out regularly to keep them from harboring disease. In our yard we’ve sunk a large Rubbermaid container into the ground and filled it with rocks and plants to create a mini pond. Nesting Sites & Materials—if you’ve provided shelter for wildlife, many birds will use these areas for nesting as well. You can also put up nest boxes and platforms to attract some species. With a little assistance, kids can easily construct a simple nest box (see the end of the article for additional resources). Once you’ve primed your yard for hosting birds and their young, you can extend the educational value by participating in a citizen science project. These projects use volunteers across the country to collect data in order to better understand bird behavior and population levels. The Cornell Lab of Ornithology currently has nine citizen science projects underway. 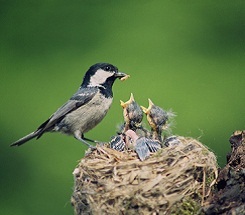 NestWatch, NestCam, and CamClickr are three projects that directly relate to nesting birds. Cornell Lab also provides educational materials free of charge to teachers, parents, and other educators. The Cornell Lab of Ornithology’s comprehensive guide to North American birds includes information about identification, life history, and songs. National Wildlife Federation’s Garden for Wildlife website has all kinds of information about attracting wildlife to your backyard. This web page is the clearinghouse for all of Cornell Lab’s citizen science projects. You’ll find links to NestWatch, NestCam, and CamClickr here. Designed for teachers and homeschooling families, these resources are also great for any informal educational setting as well. A nice pdf from the State of Virginia that includes simple birdhouse plans and instructions as well as dimensions needed for different species.